My husband and I thought a rainforest baby nursery theme was appropriate since we got engaged while we were in Australia's Daintree Rainforest and spent our honeymoon in Ecuador's Amazon Rainforest. We thought that it was only fitting that we give our baby his own little Rainforest nursery. The first thing we did was paint the walls a calming green color and used the dark brown closet doors, shelves and furniture as accents. We then installed carpet that looks amazingly like tree bark. I made the nursery window treatments myself using a bamboo pole as a curtain rod and curtains that I made from banana leaf print fabric. To give the rainforest baby nursery a tropical atmosphere we hung silk vines, tropical flowers and stuffed animals that are native to the rainforest environment throughout the room. The end result is warm and inviting and we can't wait to introduce the baby to his own personal rainforest theme nursery that mom and dad made especially for him! This wonderful room seems to reflect so much of your own personality and creativity! 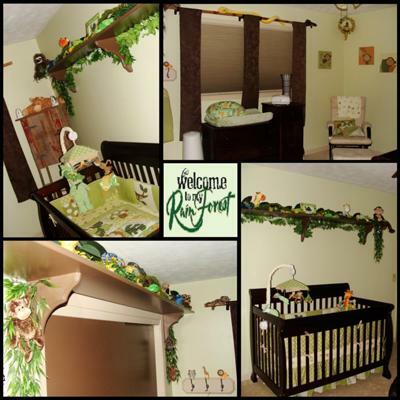 Thanks so much for sharing your rainforest baby nursery decorating ideas with us! Join in and write your own page! It's easy to do. How? Simply click here to return to RAINFOREST BABY NURSERY THEME .